Not Your Average Joe – Sloppy Joes! I’m going to start the new year off with some “real” food that is real easy! A quick and easy meal, with a little bit of a tweet to up the ante. 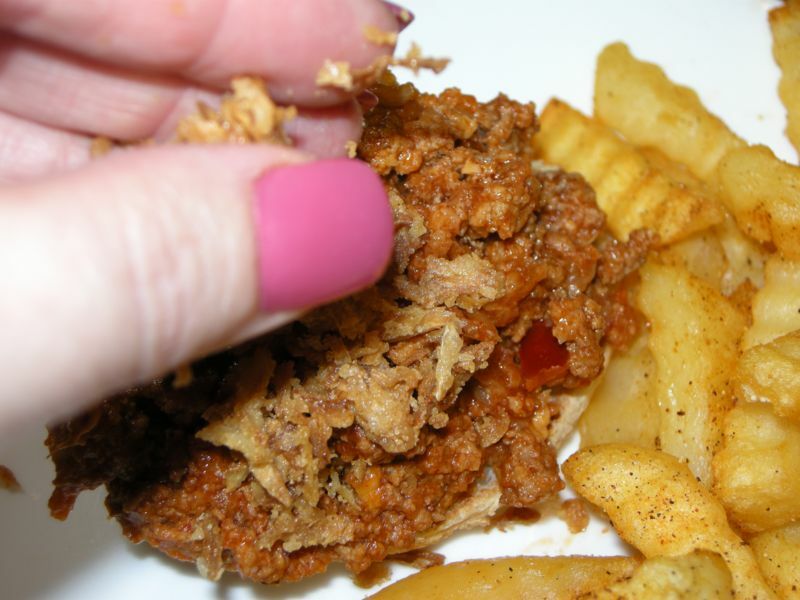 I LOVE Sloppy Joes, but this recipe adds that extra oomph that is sure to please! The first time I made these (right after I got married over a decade ago), my husband took one bite and his eyes got really big, then he took another, and his eyes got even bigger! They were almost inhaled after that. I’ve found the same reaction whenever I serve them so watch your family for those bulging eyes and you’ll know you’ve got a winner! I like to make a double recipe of this and freeze the other half for a super quick meal on one of my busier days! Why cook just one meal when the same effort and time can produce two? You’ll need: Manwich Sloppy Joe Sauce, Shredded Cheddar Cheese, French Fried Onions, and browned ground beef. My ground beef is always pre-browned and waiting in the freezer when I need it so I just popped out two bags to get about two pounds. Now you know I normally don’t get specific with brands but I have to stick by my Manwich sloppy joe sauce. I have tried several generics and they don’t even come close (some are quite horrid!). I really suggest you get this kind, unless you already have a favorite out there! Place your ground beef in a skillet. I am using two pounds, even though the can says to use one pound. 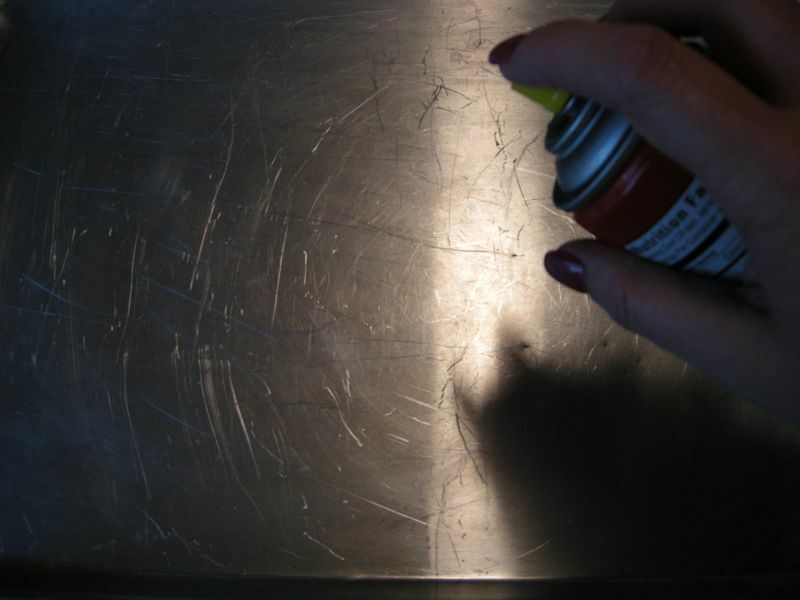 If you don’t precook yours, you’ll need to cook it and drain it before this step. 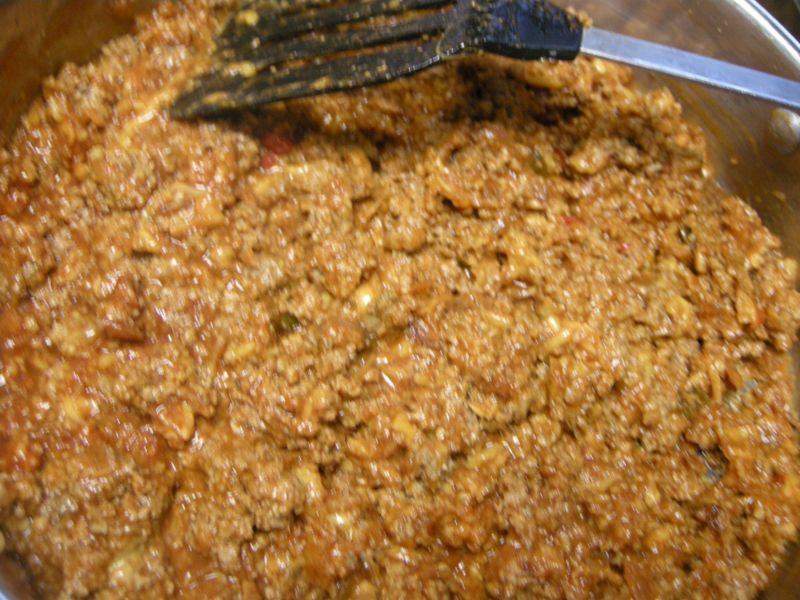 Add sloppy joe sauce…. Then add 1 Cup of cheddar and 1 cup of French Fried Onions. Stir that all up and make sure it is heated through. 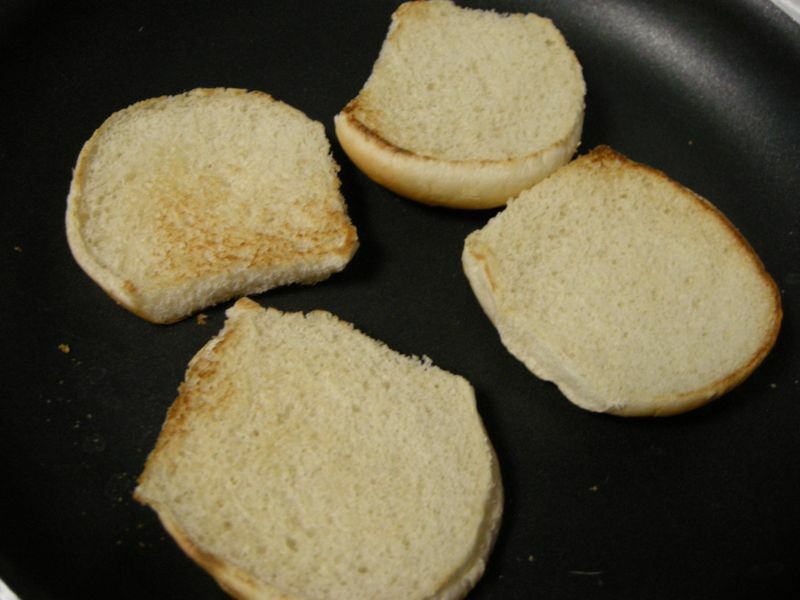 Now we need to toast our buns! I just put mine in a skillet and turn the heat on medium high. after a minute or so flip them over. Toasted buns make the BEST sloppy joes!!! For my fries, I prefer crinkle cut and usually get name brand if they aren’t too outrageously priced. these were actually just a little over 4 cents an ounce! The smaller package of the same thing was 14 cents an ounce! 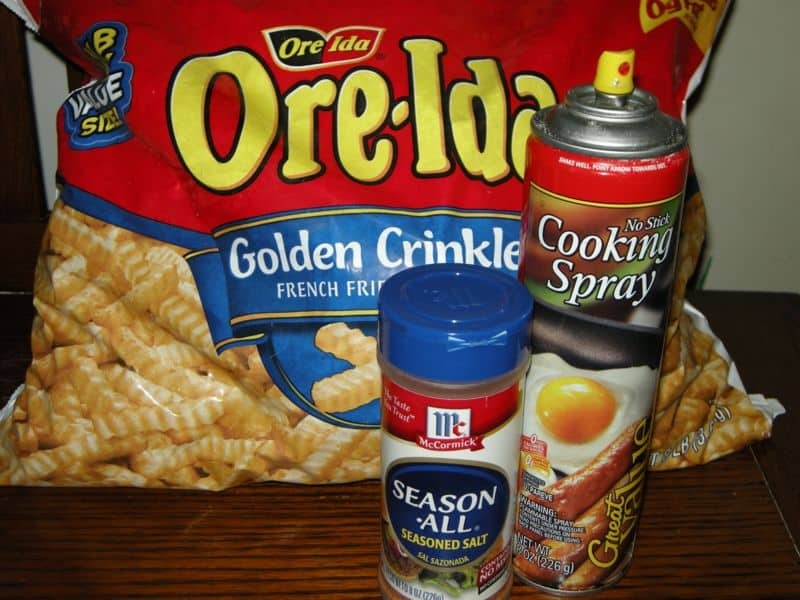 Get some cooking spray and seasoned salt. Spray a baking sheet with cooking spray. I seldom if ever deep fry my french fries. I prefer to bake them. I actually don’t do this for health purposes (although you are welcome to think that if you want! ), I just hate dealing with all of that oil when I can bake these suckers up and they taste just as good! I just put a layer of fries on my pan and sprinkle them liberaly with seasoned salt. I started to make my own seasoned salt for y’all and put a little recipe up and all…but this stuff costs 1.38 for a huge shaker of it so I just see no sense in complicating matters by making my own – and spending more money. Put your sloppy joe mixture on the toasted bun and top with more french fried onions. This little crunch and flavor is so good with sloppy joes! Serve with lots of ketchup and sweet tea! 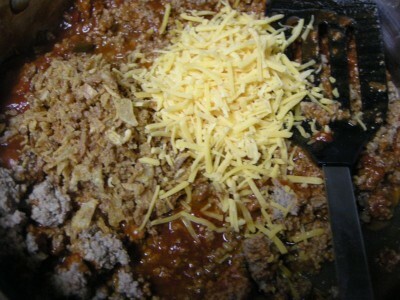 To cooked ground beef, add sloppy joe sauce, cheese, and 1 cup french fried onions. Heat until bubbly. 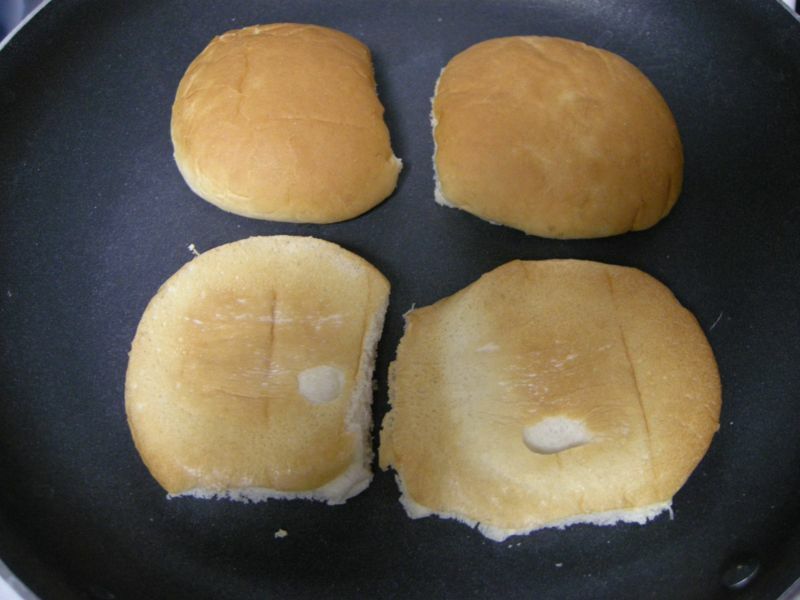 Toast buns and top with sloppy joe meat. Sprinkle more onions on top. Serve with fries. Makes about eight sloppy joes. P.S. If you enjoy reading Southern Plate, please tell your friends! Thank you! Now ya hit a soft spot! I dearly love Sloppy Joes. Sloppy Joe day back in Elementary School was always anticipated. We were never allowed to buy our lunch except for that day.. I guess cause I warted the crud out of my mama until she gave up. Well.. It was either that or because I threw my Superman lunch box in the creek because.. well.. I was a boy.. it just happened. Little boys don’t really need a good reason for anything they do. But surprisingly, I find raising a boy much easier than raising a girl, Bill! I know you brought your mother some precious moments in your time. I am trying not to laugh as we speak as I think back to the cast iron skillet incident you told me about! Hope you get a chance to try this! Its simple as simple can be, but those few added steps really make a blockbuster sloppy joe! How is your dad doing? Did you have him some cornbread waiting when he got home? We love sloppy joes around my house. I always have to fix a big batch so there will be left overs. When my son was at home, the next mornin’ would find both of us sittin’ at the breakfast table havin’ a sloppy jo. So good. Oh my!!! I’d join in that breakfast any day!!! The rest of my siblings came by for a Welcome Home/ New Years day party. They brought all the food. We had baked country ham, butterbeans, black eyes, cabbage, cornbread and green onions.. so he was happy as a clam. Sloppy Joes are great for breakfast.. I made Sausage Balls with sharp cheddar and Parmesan cheese for my breakfast/lunch. Better than cold pizza! Okay, I gotta cry foul on the cold pizza thing ~giggles~. I saw my brother eat one slice too many for me to be able to stomach it! I’m still with ya on the sloppy joes though! I have never found another person who cooks as similarly as you do! 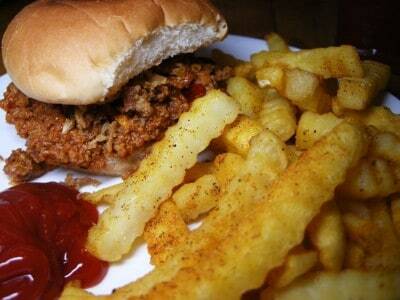 I make my sloppy joes and fries exactly the same way!!! That is just too stinking neat! You know, it seems like most of us Southern Platers all have the same taste (or awfully close) when it comes to cooking. We sure are lucky to have each other!! Sounds yummy! I love all your recipes. Well, instead of chedder, how about pepper jack? Hi Christy, love your blog and the recipes. My family prefers genuine Manwich sauce too, after trying other brands. I like to add chopped bell pepper and onion to the mix. On your precook method for freezing ground beef, do you store yours in measured cups or by weight? Just wondering how you know what amount to use when a recipe calls for an uncooked amount. For example, if a recipe says to brown 1 lb of ground beef, would you use 3/4 lb of precooked meat if it was the 75% lean kind? I measure mine by cupfuls. I usually put a cup in each bag and then grab one or two bags depending on what I’m cooking. Spaghetti would be one bag, sloppy joes or tacos (which need more meat) would be two. I hope this helps! thank you so much for reading! Dang Christy you know how to come up with the best recipes. Heck I might just have to share my recipe for Fire and Ice Tomatoes with ya’ll sometime soon. Real simple and real good alongside just about anything. Mmmmm…..I love Sloppy Joes. That was always the comfort food my roommate in college asked me to make. Along with grape Kool-aid. I will have to try with the onions. Ooooh now I want some green kool aid. I have a bit of a thing for green kool aid!!! Hope you get to try them! Thank you so much, Brindi! You are right about comfort food, these are the best! This is great! My husband shot 2 deer this weekend and picked it up from the processor last night … wow that’s a lot of meat. I’m in need of “ground beef” recipes and I’ll be sure to add this recipe to the rotation. I love french fried onions and never thought about adding to Sloppy Joe’s. So jealous of you!! FREE MEAT!!! Hope you like them! Can’t ever have too many ground beef recipes! Thank YOU For trying it and reporting back! So glad it was a hit!!! These look and sound so yummy! I have been fixing Sloppy Joes another way, but your way sounds so much easier and tastier. I’m definitely going to give this a try. P.S. 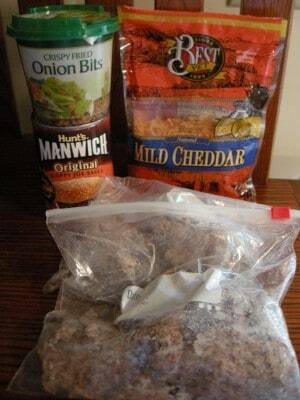 How do you prepare your ground beef ahead of time and freeze? Do you weigh it or measure it? I would love to know. THanks! I tried the recipe but didn’t like the way the french fried onions went to mush after being added. it tasted good but biting into mushy fried onions was not so good. Hubby liked the milder taste of using 2 lbs of hamburger rather than one for the one can of manwich sauce. I continue to enjoy trying your recipes and almost all are big hits. keep up the good work! Ohmistars…true confession… I HATED sloppy joes…until I tried yours! Thank you, thank you, thank you. Although I like Manwiches, it isn’t one of my husband’s favorite, but he will eat it. I made this recipe this week & he raved about it. We both agreed that it is WAY better than Manwich, or any other homemade sloppy joes. This will now be on our regular menu. Thanks for a great menu! Almost forgot to add that the seasoned frieds were a big hit as well – much cheaper than buying the already seasoned fries. I usually HATE sloppy joes but eat them anyway just because they are easy to fix and cheap. I LOVED your version! Thanks! I just discovered your site and I am loving it! I had always thought there was too much sauce for the meat in a manwich, and i was RIGHT! We’re gonna try it your way. I have to get a BIG old can of fried onions since we’re doing crunchy beef casserole one night! Oh my gosh. I have to get off of your site, my mouth is watering. I love sloppy joes! But Im a terrible terrible cook, I cant wait to go food shopping so I can try to make these and them pizza rolls. A co-worker shared the SouthernPlate website with me. I have had so much enjoyment reading the stories and making the recipes. It has brought back so many memories of my childhood. I never send any comments to any website but I had to make an exception this time. My son is in the Marines and will deploy in September 2010. He came home today for one of his last visits before deployment. I made the sloppy joe recipe for him and it was his first meal after he got off the plane and landed here in Tennessee. He said it was one of the best meals he had ever had. He said he couldn’t remember having a full belly in the longest as he has been eating MREs. After his 3rd sloppy joe, he said he really missed his momma’s cooking. Thanks SouthernPlate for making a Marine satisfied and a momma really happy! Hey, I love your website! I have been addicted sice I saw you on the Today Show and wanted to look you up. I grew up in Decatur, AL and moved to Texas about 1 1/2 year ago. It is nice to hear someone that sounds like me!! My 12 year old son loves sloppy joes, but none of the rest of us do. I fixed these and we all loved them. Thanks! I am so glad you found us! Welcome to the Southern Plate Family!!! I am so glad to hear that you all liked the Sloppy Joes. That looks like the perfect meal for us to have here on Wednesday night! Thanks for making the suggestion, Christy! I hope you enjoy Claire!! Have you ever tried frying 1 & 1/2 lbs. ground beef with one small chopped onion. 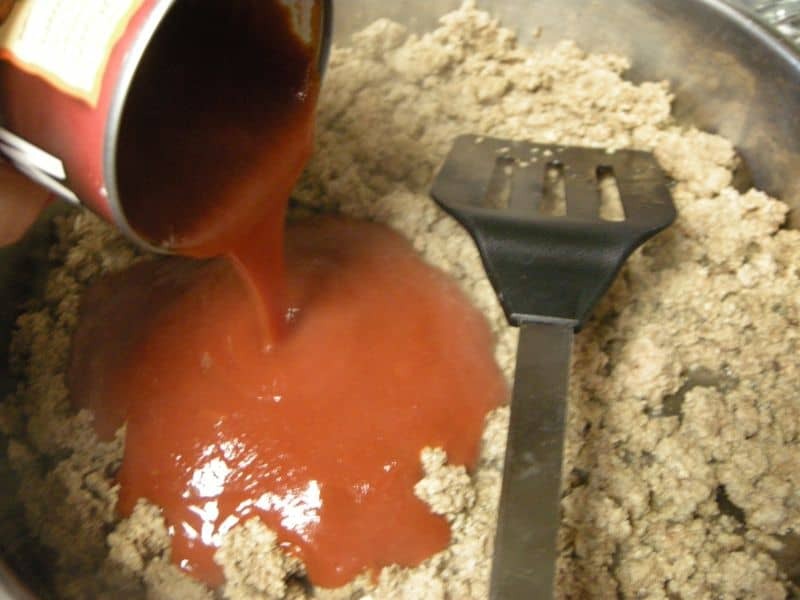 Drain and add 1 & 1/2 cup ketchup, 1 tbl. brown sugar, 2 tbl. french’s mustard and 1/2 cup water to simmer? That makes a good sloppy joe sandwich. 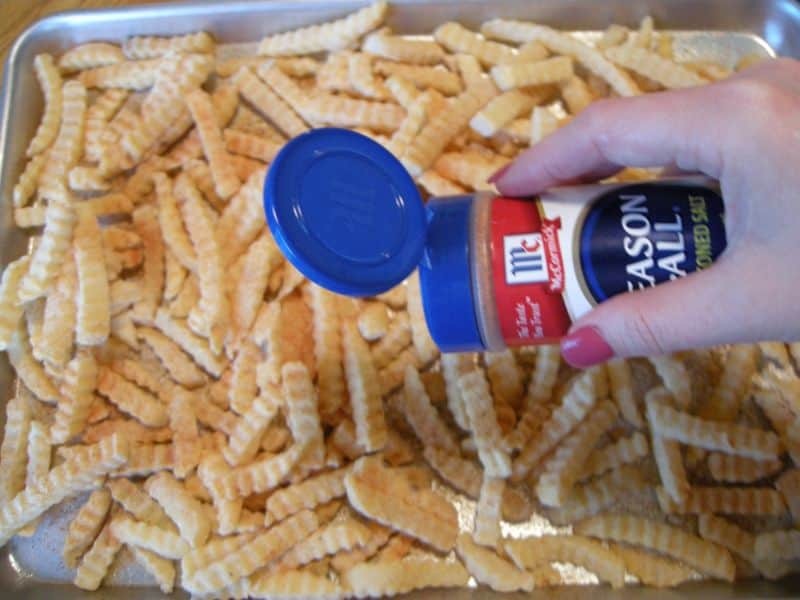 Also, try Tony Cashere’s Creole seasoning on your fries next time. It is spicy and good. We also use it on popped corn!!! Have you tried Manwhich BBQ flavor? It is SOOOOOOOO GOOOOOD!! We like our sloppy joes with some melted Velveeta on them . Try the BBQ flavor…you’ll love it ! I totally agree that Manwich brand is the best! Sometimes we serve it over cornbread and call it Southwest Sandwiches. Try it; it’s great! We LOVE these sloppy joes! They are so yummy! Thank you for the recipe. Love your cookbook. I have a question though, do you know why ground beef is now so tough and cooks up like worms? My Dad would always stir in a can of Tall Boy vegetable alphabet soup into his sloppy joes to hide veggies for us to eat. Now that L&S is closed (the only place that carried Tall Boy), I just use Campbells. I made this tonight, it was delicious! I put it on homemade french bread and melted Pepper-Jack cheese on each side. The French Fried Onions gave it just the perfect kick. Thanks for the recipe!